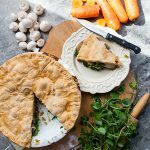 There’s nothing like a hearty pie when it’s cold outside and this vegan mushroom pie with potato and watercress will warm the cockles of the chilliest heart. 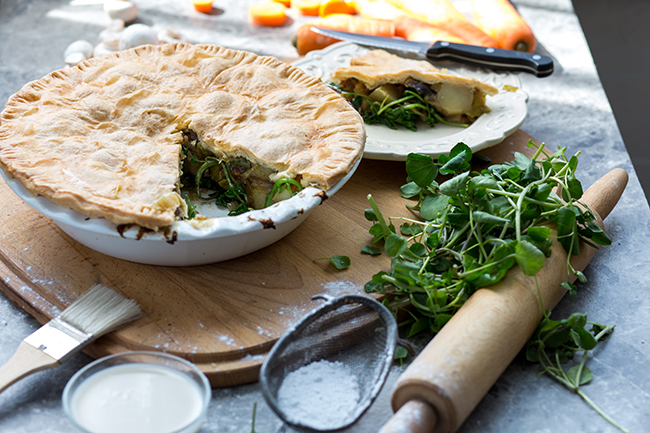 There’s nothing like a hearty pie when it’s cold outside and this vegan option will warm the cockles of the chilliest heart. Preheat the oven to 180°C. Place the potatoes into a pan of cold, salted water. Bring to the boil and simmer for 10-15 minutes or until just tender. Drain well and set aside. Heat the rapeseed oil over a medium heat in a large frying pan or wok. Add in the onions and carrots along with a good pinch of salt and fry for five minutes. Then add the leeks and mushrooms and continue to cook for a further 6-8 minutes, or until all the veg is soft. While the veg cooks combine the vegetable stock, water, soy sauce, yeast extract and Worcestershire sauce (if using) in a jug. Whisk to ensure that the veg stock is dissolved. Stir the plain flour, garlic and thyme into the vegetable mix and cook for a further 1-2 minutes, then stir in enough of the liquid so that a thick sauce is created. Bring to a simmer then stir in the watercress and remove from the heat. Taste the mixture and add salt and pepper as needed. Pour into a large pie dish. Roll out the shortcrust pastry to roughly the thickness of a pound coin. Cover the pie dish completely with the pastry then trim carefully. Crimp the edges with a fork and make a few small cuts in the centre to allow steam to escape while cooking. Place the pie into the centre of the oven for 30-40 minutes, or until the pastry is cooked and golden brown. Remove from the oven and allow to rest for five minutes before serving. These recipes were created by Keri Astill-Frew who splits her time between being a development chef for The Watercress Company and building her own vegetarian and vegan catering business, V Dorset. Keri has worked in top restaurants across the UK including a Michelin star hotel in Lancashire and a variety of fine dining restaurants and gastro-pubs in Dorset and Sussex. She is passionate about watercress, both as an ingredient and for its fantastic health benefits and is devoted to developing new and delicious ways for you to incorporate more of it into your diet. What defines us as vegans? 18th April 2019, Comments Off on What defines us as vegans?